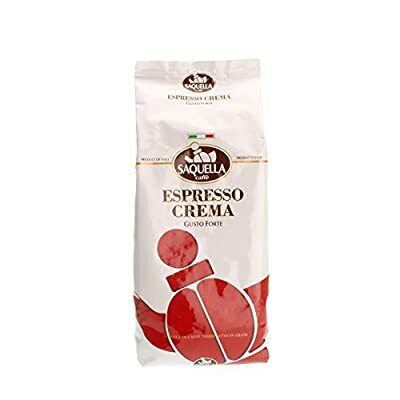 Saquella Espresso CREMA Slow Roasted Gourmet Italian Espresso Coffee is a blend of the highest quality Arabica and washed Robusta coffees designed to offer a true deep southern Italian style espresso, espresso crema is strong, deep and memorable. 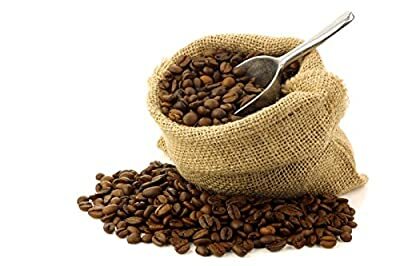 CREMA contains 40% arabica for delicate flavours notes and exceptional sweetness and long mouth filling flavour combined with 60% washed high quality Indian Robusta to complement the arabicas by providing a solid baseline to underline the arabica's qualities. Our darkest roasted and strongest espresso, CREMA is powerful full-bodied, chocolatey and rich with an intense and persistent flavour, we have developed this blend to be exceptional when enjoyed either as espresso or under milk where its strength will come through the sweetness of the milk easily, so, it is a perfect all round selection for your coffee machine. Espresso crema is also our highest caffeine espresso so if you need a lift this is the one to pick. Packed and nitrogen flushed to retain freshness, the Saquella ESPRESSO CREMA Slow Roasted Gourmet Italian Espresso Coffee delivers a truly authentic Italian espresso experience; roasted by a 5th generation Italian family business in Italy, this is not an "Italian style" inferior copy, this is the genuine article and if you love coffee then nothing else will do. The Saquella coffees are a skilful blend of 10 distinct, very high quality origin, arabica and robusta coffees sourced from around the world. 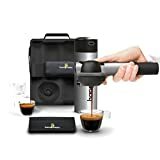 Each is from trusted long term partners, selected for its unique flavour characteristics to give the full palate experience of Saquella espresso. The Saquella roastery in Pescara slow roasts all their coffees for in traditional drum roasters. 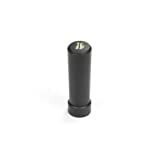 This allows the coffee beans to polish and to ensure the full development of the individual elements of the espresso. These coffees are then packed in a protective atmosphere to preserve their very special character and to allow the full flavour to develop.